Another month and another great issue of Creator-Owned Heroes! 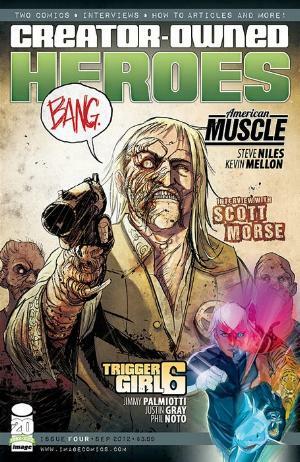 That’s right, Image Comics’ Creator-Owned Heroes #4 from Jimmy Palmiotti, Steve Niles, and friends dropped this week. The two ongoing comic stories, Trigger Girl 6 and American Muscle wrap up in this issue, in addition to the usual assortment of essays, interviews, and goodness — this is not one to be missed. The conclusion to Trigger Girl 6 from Jimmy Palmiotti, Justin Gray, and Phil Noto took a turn that really surprised me (and if it didn’t surprise you too, I call shenanigans). I can’t even really talk about the plot without giving the twist ending away, and I refuse to spoil it for you. I will say that this final chapter has a unique sci-fi/environmentalist moral that comes from some very unlikely voices. Nice work, gentlemen. Next month will be the start of a new series involving assassins titled Killswitch, from Jimmy Palmiotti, Jerry Lando, and Paul Mounts — so don’t miss out. Steve Niles and Kevin Mellon’s American Muscle also wrapped up in this issue, with a wild car chase and the fate of some characters teetering precariously in the balance. This installment of American Muscle was probably my favorite to date, and I really liked the moral that sometimes we must take the journey to realize what we had all along. Next month Steve starts a new two-part old west serial killer story with Jay Russell and Andrew Ritchie titled Black Sparrow. The art for this upcoming story looks really cool, and the idea is intriguing – so be sure to preorder Creator-Owned Heroes #5 ASAP! Readers are sure to enjoy the essays and interviews this month. Justin Gray explores heroism and offers some good hints on how to beat writer’s block in his Scattered Thoughts column. Jimmy talks about his experiences at this year’s SDCC and Tr!ckster in Listen 2 Jimmy. In Conventions On My Mind, Steve Bunche totally nails an article about why comic conventions are such amazing experiences. Steve interviews Scott Morse in a great piece that compares and contrasts the differences between working on creator-owned projects and more mainstream titles (each really does seem to have distinct benefits) and so much more. Kevin Mellon takes some time to share some of his work and talk a little about his art and process. Then J.G. Vaughn closes it all out in an article about forging good relationships with editors (that is also applicable advice to building relationships with just about anyone working in the comics industry). 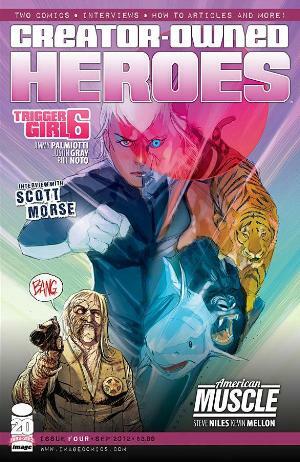 Creator-Owned Heroes has quickly become one of my favorite titles on the market, and I get excited when I see it on the new release list. Not only do readers get two great comics, they get good insights into the industry and its creators. Preorder this title, buy it, spread the good word — and maybe Creator-Owned Heroes will be around for a while. I certainly hope so. Be sure to check out our reviews of Creator-Owned Heroes #1, #2, and #3. “Like” Creator-Owned Heroes on Facebook as well. Haven’t read Creator-Owned Heroes yet? Read Creator-Owned Heroes #1 for FREE on comixology!